NESSELRODE KARL – Russian Count and Diplomat. Attractive D.S., Comte Nesselrode, three pages, written to the first, third and fourth, on a 14.5 x 9 folio, Saint Petersburg, 17th July 1845, to Yakov Tolstoy, in Cyrillic. 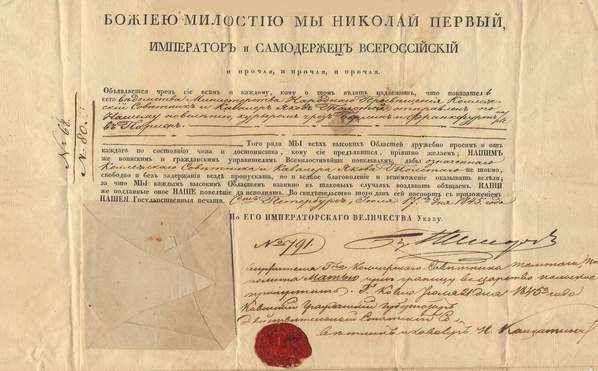 The partially printed document being a title-passport, with the heading `By the Grace of God – Nicholas I – Emperor and Autocrat of All Russias´, in favour of Yakov Tolstoy, High Messenger of the Emperor, and states `It is announced, by this title, to each and everyone, and to whom it may concern, that Yakov Tolstoy, Collegiate Counselor and Knight of the Ministry of National Education, is sent as special messenger by Our order through Berlin and Frankfurt to Paris.´ and further continues `For this purpose We friendly ask all the high Regions?according to ranks and merits of those to whom this might be shown? and to our military and civilian commanders, who WE most graciously order not only to let pass the aforesaid Collegiate Counselor and Cavalier Yakov Tolstoy freely and without restraint, but also to show him benevolence. In return, We promise to recompense each high Region. This Our order will be obeyed by Our subjects. As an evidence this pass is issued together with Our State Seal.´ and concludes at the foot with `According to His Emperial Majesty’s Decree´. At the foot of the front page, and written in another hand `The servant of the Collegiate Counselor Tolstoy, Hypolite Mathieu must be allowed to cross the border of the Polish Kingdom. Kaunas, 21 July 1845.´ signed beneath by the Civil Governor of Kaunas, N. Kalkatin. The document bears a red wax seal to the front in very fine condition, alongside a paper seal affixed. To third page, a partially printed text, being the German translation of the front text, Signed in another hand `Graf von Nesselrode´. To the fourth page, showing five different annotations, with signatures beneath and four ink stamps, corresponding to the different frontiers Tolstoy did cross, all bearing location and date, three in Cyrillic, one in German and the last in French, reaching Paris the 10th August 1845. Folded, with small, minor overall age. Auction result was result 1300 EUR! But again I believe the buyer was rather an autograph than a passport collector. However a nice and interesting document.